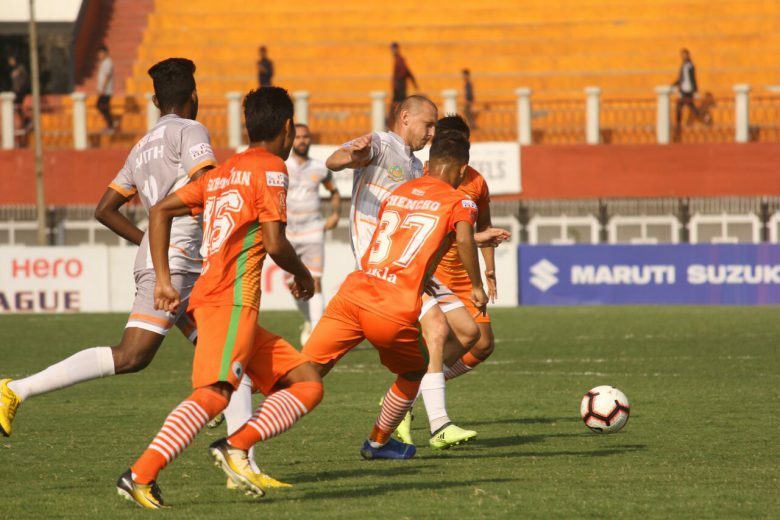 Imphal, February 11, 2019: Chennai City FC and Neroca FC shared six goals in a thrilling draw as the 12th Hero I-League title race was blown wide open on Monday. Chennai City FC is the league leader and is two points clear of debutants Real Kashmir FC. Neroca is in the fifth spot. The visitors scored thrice in the first half as Pedro Manzi (34’; 41’; 45’+1’) registered his fourth hat-trick of the season. Neroca bounced back in the second half through Felix Chidi’s 52nd-minute strike followed by a goal each from Chencho and Aryn Williams in the 68th and 88th minutes respectively. Manzi was adjudged the Hero of the Match. Chennai missed one part of their Spanish armada as defender Roberto Eslava didn’t play with Pandiyan being his replacement. Slovak utility player Jozef Kaplan featured in the first XI as coach Akbar Nawas put Jesuraj on the bench. Manuel Fraile also made two changes to the home team’s starting line-up as he played Tondomba Singh and U-22 player Naocha Singh in place of Ashok Singh and Abdul Salam respectively. Neroca dominated the first half as left-winger Singham Subhash Singh troubled the Chennai defence with repeated forays down the left flank. Two such forays in the 17th and 20th minutes found out Katsumi. The Japanese went closer from the first attempt as he made good contact on the near post but missed the target. A wonderful ball from Aryn Williams in the 26th minute found Chencho through. The Bhutanese sniper rounded the goalkeeper only to have his attempted cross from a narrow-angle cut out for a corner. But in the 34th minute, as has been the norm this season, Chennai’s Spanish trio combined to give them the lead against the run of play. Sandro found Nestor Jesus on the left flank with a long ball from just inside Chennai’s own half. The mercurial Nestor cut in and played Manzi in. Manzi swooped in and slid the ball into the net between goalkeeper Lalit Thapa’s legs. It was his 14th goal of the season so far! Nestor also recorded his sixth assist with as many goals in the season. Liberian defender Varney Kallon inexplicably gave the ball away to Manzi with only the goalkeeper to beat. The striker drove forward and coolly slotted home over the custodian’s right shoulder in the 41st minute. Neroca had a chance to get a goal back as Malem was in the clear thanks to a fine ball by Aryn Williams. But the midfielder’s powerful strike was superbly saved by substitute goalkeeper Kabir. Manzi completed his fourth hat-trick of the season in the first minute of added time. Pandiyan broke away on the right and delivered a cross towards goal and Manzi struck with his left foot out to beat Thapa on the near post. Neroca had other ideas and was not going down without a fight as they struck early in the second half through substitute Felix Chidi. Chencho played Chidi inside the box from the left in between two defenders. Chidi controlled the ball, rounded the goalkeeper, and slid it into the empty net for his sixth goal in the league so far. A wonderful move by Williams from the right had Chidi’s header go wide of the goal from close range. Neroca who had created pressure with two successive corners got their second goal through Chencho. Singham Subash crossed in from the right flank and Katsumi headed it back towards a lurking Chencho. He controlled and drilled the ball past goalkeeper Kabir to score his second goal in as many games. This is Chenco’s second stint in the Hero I-League; he was the star performer the previous season. He missed a chance to draw the game level after a defensive lapse had him one on one with Kabir, who pulled off a brilliant save to deny the hosts. A shaky Chennai looked to have scraped through for a win only for Neroca to make it 3-3 with Williams’ goal in the 91st minute. Super Division: Reliance Youth carousel sends West Zone into a tizzy!